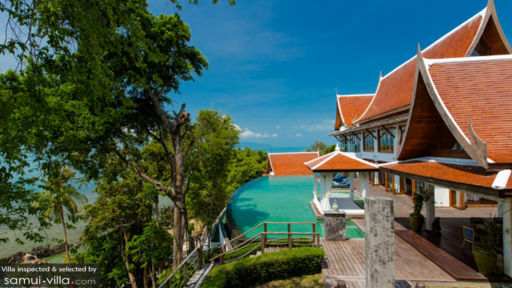 Villa Riva Samui is a cluster of about four pavilions – all typifying traditional Thai architecture and Oriental design. Spacious interiors are appointed with predominantly hefty, finely finished as well as intricate wood furnishings and fixtures and modern, luxurious pieces. Amenities are discriminately five star – for all-out guest delight and enjoyment. Perched on a headland above Bang Po Beach, Villa Riva Samui, truly, opens up for you grand vacation living with a mood that’s undeniably extravagant and exotic. All combined, the villa has eight air-conditioned bedrooms. Four bedrooms are in the master pavilion. The master bedroom, on the second floor, has a four-post, draped king-sized bed, as well as a dedicated bathroom with a jacuzzi and indoor and open-air rain showers. Two guest rooms, on the ground floor, have king-sized beds, as well as dedicated bathrooms with fitted bathtubs. One of these bedrooms is provided with PWD access. One more bedroom – for teenagers – has twin beds, as well as a dedicated bathroom with a rain shower. The two-storey guest pavilion A has two bedrooms – one on each floor. Both have king-sized beds – one of which has drapes and four posts – as well as dedicated bathrooms – one with a fitted bathtub, and the other with a rain shower. The two-storey guest pavilion B has, on its second floor, one bedroom – with a queen-sized bed – connected to a children’s bedroom – with a single bed . Both bedrooms share one bathroom with a fitted bathtub. The glimmering gem of the property’s expansive exterior is the 32-meter swimming pool. Dive into its beckoning, crystal clear waters for your brisk, routine laps. For a breather, you can stretch out on cushioned, woven wood pool beds partially covered by large umbrellas on the poolside wooden deck, or on the soft mattresses under the shade of the sala at one end of the swimming pool. 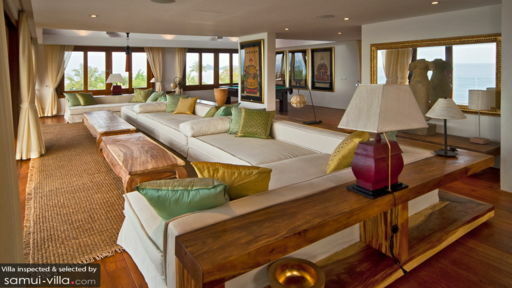 On the sunny, breezy and high-ceilinged ground floor of the villa’s club house is the living area. Around its hefty couch and chair, you can all converge for moments of family or friendly bonding. There are two dining areas. The indoor dining area – with its wide, circular, timber wood table that accommodates 10 – is beside the living area. The alfresco dining area – with its timber wood table that seats eight – is at a semi-open and spacious sala beside the club house. Whichever you prefer to dine at, you can all have your fill of authentic Thai cuisine – as well as your most requested comfort food – freshly cooked by the resident chef at the well-equipped, modern kitchen within the club house. On the mezzanine of the club house is a game room where you can all show off your magic on the billiards table. On the upper basement of the club house is the villa’s health and fitness area complete with a gym, a sauna, a steam room and a massage room. On the lower basement is a cinema room where you can go on a marathon of your can’t-get-enough-of movies. Out on the villa’s grounds is a tennis court where you can all vie for most of the bragging rights. Assigned to attend to the daily services of the villa is a staff headed by a manager backed by a gardener, a driver, as well as by housekeepers. Aside from the chef, a babysitter and a spa therapist may be called in upon your request. Their services, however, come with a separate charge. Car and boat rentals are available. 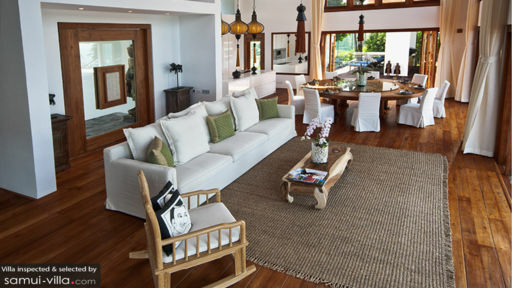 Villa Riva Samui is located in a secluded part of Bang Po Beach. From the villa, the exclusive access takes you down to the shore. Choose a flat spot where you can, ideally during high tide, go swimming. On your next day tour, explore the Hin Lat Waterfall, the Magic or Secret Buddha Garden, as well as Na Thon Bay where you will find the eight-headed coconut tree. Then catch, at the Bang Makham Stadium, a buffalo fight. Must-try dining places close by are Koh Kaew, Sunset and Krua Savoiey.